BAD is the only one national representative association for patients and diabetics in Bulgaria . It wascreated in 1990 from famous bulgarian endocrinologists , doctors and patients, sub-leadership of prof. N. Colebinov. We fight to make the life of the diabetics in the entire country better including approving their treatment and prophylaxis . To achieve our goals we expec from the state to ensure the needed conditions on contemporary treatment and self - control of the diabetes and systematic prophylaxis of the diabetic complications ! We also defend the rights of the diabetics and aim to solve their problems through the competent institutions of health and state department . 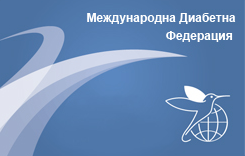 The leadership of BAD works in a close co-operation with all the patient organizations of the Confederation for Defending of Health , with the Bulgarian Association of Endocrinology , with the Medical Diabetic Association, with the Bulgarian Association for treatment Diabetic Stage , with the society of the Diabetic Nurses in Bulgaria and many Bulgarian and international organizations . One of our main goals is to tutor each diabetic to keep and support permanently its hemic sugar ALONE in its relative normal limits, that most surely will fence him from all fixes and complications of the diabetes!!! We are going to cooperate you to create your own diabetic association in your local area or contact nearest one ! If you have some concrete issue of treatment and self - control of diabetes as well contact us and we are going to make every endeavour to help you!!! Currently , in Bulgaria there are approximately 520 000 diabetics . If we stay TOGETHER and state clearly our needs , requirements and suggestions the government won’t be able to neglect them and will have to take the above into consideration.